A polyglot programmer and enterprise architect having hands on experience in Ruby,Python, PHP, Perl, Java and many other languages. Specialist in Devops, Cloud migration and implementation on Amazon Cloud (AWS), Google Cloud (GCP) and Microsoft Azure along with Hadoop programming for big data processing. What is the use of dynamic inventory in Ansible? Git : How to use git to create a local backup restoration plan? How much experience you have in Devops? AWS architect : What an architect does? VMware on AWS : What you need to know? Is a knowledge of Hadoop required to learn Spark? Why do we use a token concept in PHP? Devops for QA : Is programming required? What is the best Linux software to monitor web traffic on router? How to handle checkout when we are selling unique products? In defense of QA team: Who is responsible for errors in any software or website? What are some limitations of PHP? Drupal vs Zend : which one should be used for application development? Why randomization is a difficult algorithm to implement? 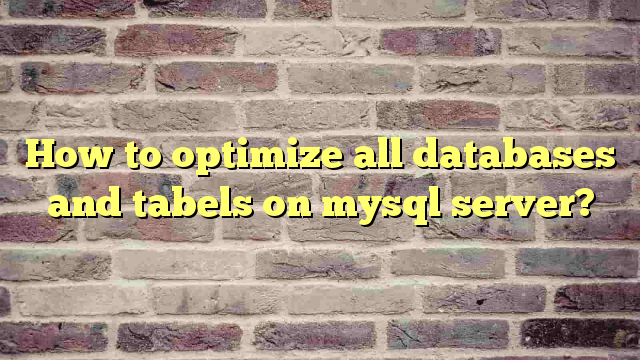 How to optimize all databases and tabels on mysql server? How to optimize Magento speed? PacktLib Review : Why these big names can not manage thier services properly? What you should know in wordpress to be a wordpress programmer? Optimization of database tables in mysql is a process which has to be carried out regularly to make your database in good health. OPTIMIZE TABLE should be used if you have deleted a large part of a table or if you have made many changes to a table with variable-length rows (tables that have VARCHAR, VARBINARY, BLOB, or TEXT columns). Deleted rows are maintained in a linked list and subsequent INSERT operations reuse old row positions. You can use OPTIMIZE TABLE to reclaim the unused space and to defragment the data file. After extensive changes to a table, this statement may also improve performance of statements that use the table, sometimes significantly. In phpmyadmin you can see data similar to following screen if your database tables are not optimized. Entries in Overhead column indicates size of data space which can be reclaimed after optimization. 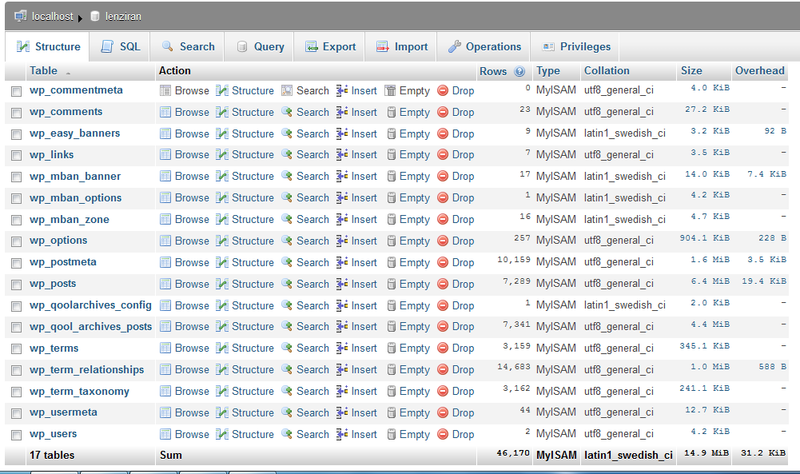 A major challenge comes in optimization when you have many databasesm thus many tables on my mysql server. It is hard to do optimization manually for each and every table. So we have created this script which can optimize each and every table of each database on your mysql server. You can run this script as your cron script also so you can do your optimization activities automatically. We have also executed repair statement which will repair any table error. Execution of this script may take some time depending on the size of databases and tables.